Q. I need to return a book but the library is closed. How can I return the book? To return a book from a USMAI library to one of the UMD Libraries when it is closed (or even open, actually), use an outdoor book drop at one of several locations on campus. 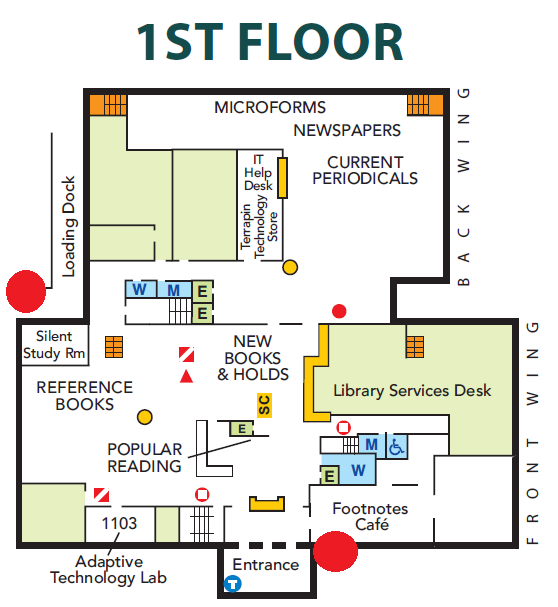 One book drop is located on the right side of the main entrance to McKeldin (it is set into the wall). There are two others located next to the loading dock on the back, left side of McKeldin (both are large metal boxes that say "Book Return" on them). These locations are indicated by the large red circles on the map below. Most of the other branches of the Libraries have outside book drops too; for phone numbers to inquire when the Libraries are open, click on this page. For Hours, click on the Hours tab at the top-center of the Libraries' homepage. ILL books (the books which have a black paper strap around the cover) can be returned in the book drops at McKeldin Library, the STEM Library, the Performing Arts Library, or the Priddy Library at Shady Grove.